Moist woodlands, grassy areas. 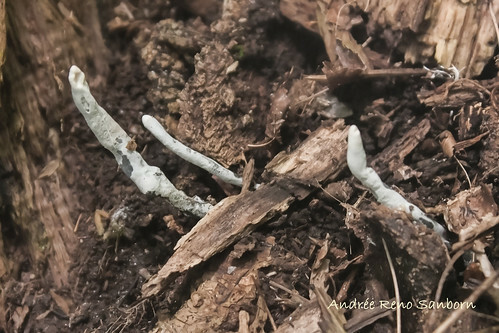 On soil with decaying leaves and grass stems. The fruiting body is a small clump or cluster of cylindrical growths resembling worms or bean sprouts. The growths are very fragile, erect or ascending, often curled, 13 ⁄16″ to 4¾″ long, and ⅛″ to 3 ⁄16″ thick. They are white to translucent white, sometimes flattened or grooved, and usually unbranched, rarely forked at the top. As they age they turn yellow to light brown from the tip down. Fairy Fingers are so fragile that they will break with almost any handling. Some clumps of very nice white finger fungus in a field near my house. There are dozens of types of fungus around my local area but I've never noticed these ones before so I took a quick video of them.